Plagued by a multitude of turnovers Tuesday night, the Blackburn Beavers basketball team resembled that of Mike D’Antoni’s current Los Angeles Lakers. Consequently, the Panthers procured their seventh win of the season through tenacious defense and a multitude of easy baskets. Led by four members scoring in double digits the Panthers reached the century mark, outscoring the Beavers 100-48. The Panthers did not waste time, scoring. Todd Albertson scored the first two points of the game twenty seconds into the game. By the 8:50 mark of the first half George Barber’s boys had a six-point lead, 24-18. At this point Blackburn’s coach, Jason Baribeau, called an appropriate time out in the attempt to keep the game from getting too far from the Beaver’s grip. However, by the end of the first half, the Panthers unrelenting defense and quick-scoring offense had widened the lead to twenty, 48-28. Due to Greenville’s perpetually pesky defense Blackburn’s offensive woes did not cease in the second half. Meanwhile the Panthers continued to enhance their own offensive play in the second half. As a result of their daunting defense and easy baskets Barber’s team quickly made defeat unavoidable for the Beavers. The Panthers went on to outscore the Beavers by 32 in the second half. Throughout the contest the Panthers implemented Barber’s call for unrelenting defense, aggressive offense, and high character. As a result the Panthers won with its second largest margin of victory on the season, 52. Tuesday night’s game was indicative of Barber’s emphasis on team defense and quick, attack oriented offense. Leading the attack for Barber was Junior guard, Alex Mumphard. Mumphard led the Panthers with 22 points, including a number of demoralizing three-pointers in the second half. Following close behind were Anthony Metzler, Austin Potts and Todd Albertson, with 18, 13 and 10 respectively. The Panthers are now 7-5 on the season and 2-2 in SLIAC competition. 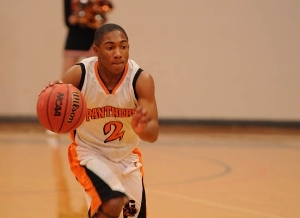 The Panthers play their next home game against fellow SLIAC member Eureka on Saturday, January 12th at 3 pm. Previous articleDiet Drinks Linked to Depression? This article is a slam dunk.